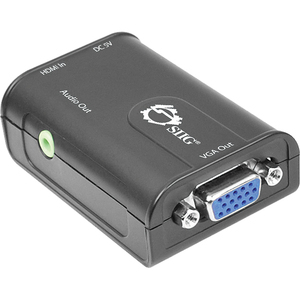 SIIG's HDMI to VGA + Audio Converter is designed to enable the connection between the latest HDMI digital devices such as Home Theater PC, HD/Blu-Ray DVD Player and Gaming Console and the analog display units. It converts digital HDMI signal to analog VGA and stereo audio. Not only can the digital video signal be flawlessly transformed, the converter grabs digital audio signal from HDMI source then converts it into 3.5 mm audio jack that most frequently available to speakers, home stereo systems or AV receivers. It is easy to install and makes high definition video and audio more affordable and accessible to fulfill your needs. The HDMI to VGA + Audio Converter is FCC & CE regulatory approved and RoHS-compliant and backed by SIIG's limited 3-year warranty.